Twice a month our children are offered a story told with learning tools placed in a basket related to the story's theme. They are then asked to wonder about the story together, with each child encouraged to figure out what the story means to him or her individually. Each story basket is kept in a particular place on the classroom shelves so that children may further explore this or other stories on their own during free-play. During free play, children may choose from art materials or other story baskets as their work for the morning. This program takes into consideration the multiple learning styles that children have and the multiple ways intelligence manifests itself in their activities. There is a great deal of freedom to move around the classroom during free play, and then children come back together for a closing circle. This method develops a community of children in a sacred space and gives children the spiritual language to talk about what is most important to them. It also gives them a measure of freedom to choose activities that speak to them. 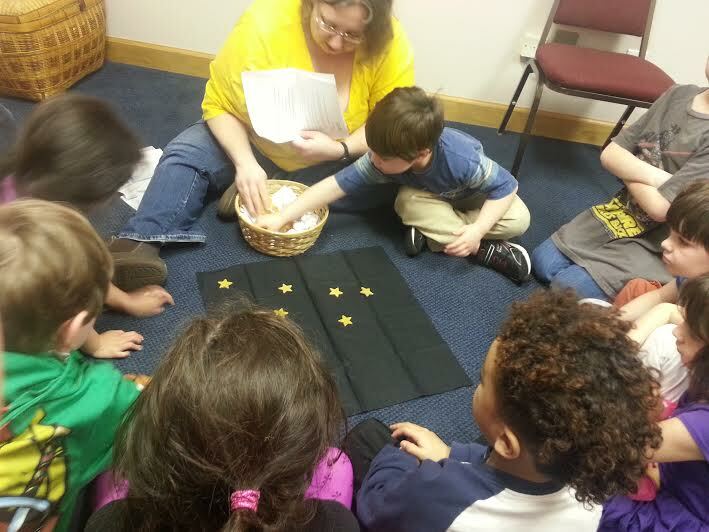 If you are interested in leading a story basket session with our children, please contact our Director of Religious Education at dre@uufdekalb.org.